As Europe continues to show disinterest in increased involvement with Russia, the country is increasing its ties in Asia. Among Russians, the desire to live in Europe is weakening -- at least according to a report from the Center for Strategic Research presented recently at the annual meeting of the Valdai Discussion Club. Based on data from focus groups, social scientists claim that only 33 percent of the Russian middle class fully shares traditional European values. On one hand, European countries top the list of nations with whom closer ties would be desirable for Russia. On the other, Russian residents no longer want their country to have closer integration with a united Europe. Obvious fatigue is increasingly seen in Moscow-Brussels relations, as the parties are hesitantly moving toward taking a break to figure out how to go on. Such a break is certainly needed: The agendas for the annual Russian-EU summits are constantly shrinking, boiling down to discussion of recurring issues. In Russia, there is a growing impression that a united Europe is no long capable of long-term strategic decisions. Most of the questions raised as priorities in top-level negotiations have not seen practical development. Work on a new agreement between Russia and the EU is stalled, and slow negotiations are underway in four areas: document security, illegal migration, public order and external relations. Moscow is tired of waiting for Brussels to once again show interest in closer ties with its eastern neighbor. 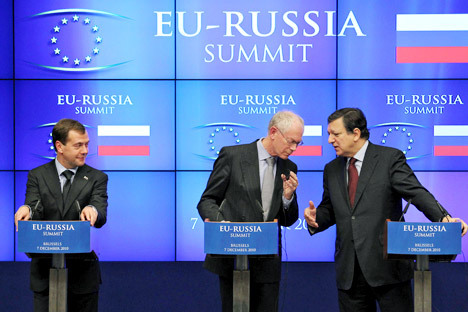 Russia is ready to partner with the EU, but only on equal terms. It’s beginning to seem like Europe is interested in preserving an asymmetrical trade system with Russia. This is understandable: The world is full of goods and services. Asia, in contrast, is actively seeking ways to get closer to Russia and is ready to grant it equal partner status. Asian countries see that rapprochement with Moscow has considerable economic potential. In 2012, Russia will become the first chair of the Asia-Pacific Cooperation Council, and the next APEC summit will be held in Vladivostok. Russia won’t abandon its European “status” in the next five to seven years. But at the same time, it will become more actively integrated into the new world, where Asia dominates.